kRiShNa janmAShTamI कृष्ण जन्माष्टमी is coming soon, the eighth night after the full moon of shrAvaNa श्रावण month, that is this 21-22 August 2011 (night of 21st).We will visit some of the most popular shloka-s about kRiShNa. 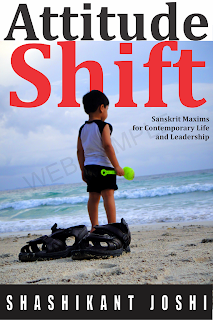 Read/Buy the book "Attitude Shift - Sanskrit maxims for life and leadership" in print or Kindle e-book and support Practical Sanskrit activities. vasudeva वसुदेव was kRiShNa's father, and hence kRiShNa is also called vAsudeva वासुदेव . Note the first 'a' becoming 'aa' or 'A' a long vowel. See the earlier post (Salutations to Krishna - गोविन्दाय नमो नमः) for details on this. this words comes from divya, which means brilliant, splendid, luminous. 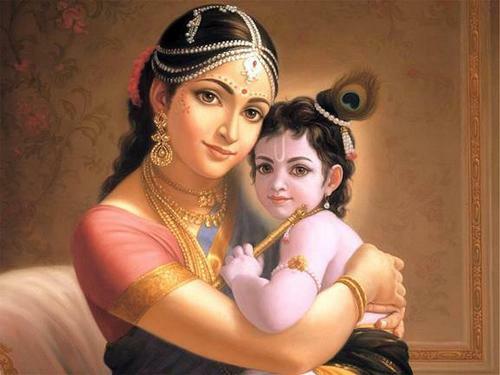 kaMsa कंस was kRiShNa's mother's brother and for his fate, he believed a prophecy that his sister's eigthth son will be his death. purANa पुराण also tells us that kaMsa कंस and shishupAla शिशुपाल were the third and last incarnation of viShNu's gatekeepers, jaya जय and vijaya विजय . And they were cursed by RiShi-s ऋषि to go down to the mortal world, due to their rudeness to the RiShi-s. 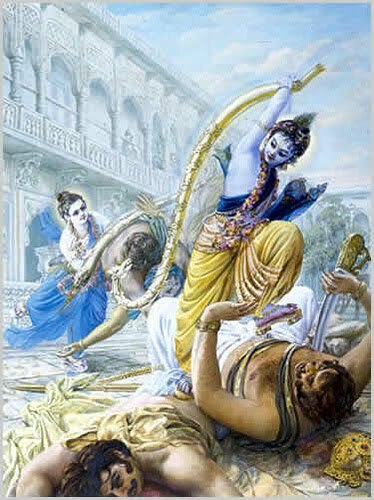 The only way for them to come quickly back was for them to be the greatest evil-doers so that viShNu himself will have to come down and kill them to liberate the earth of atrocities. The other incarnations were the brothers hiraNyAkSha हिरण्याक्ष and hiraNyakashipu हिरण्यकशिपु (causing the varAha वराह (wild boar) and nRisiMha नृसिंह (man-lion) incarnations of viShNu) and of rAvaNa रावण and kumbhakaraNa कुम्भकरण (causing viShnu to come as rAma राम ). Q: I appreciate the deep thinking behind this inspirational thought. 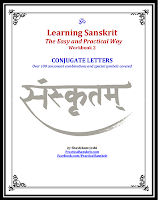 Is it the proof because the words can be expressed in Sanskrit, the Perfect language? Does chanting the Sanskrit words in the link - with deep pathos - open the door to the Universe? are you asking that whether the proof of kRiShNa being jagadguru is that it is said in the sanskrit language? if that is the question, the answer is a definite no. all devotion is a matter of faith, no matter which religion or cult or sect. one gets from the teacher, doctor, mantra, wife, minister, medicine, god according to one's faith in them. to the second question, does chanting this with deep pathos open door to the universe? so, here you have already brought the deep pathos, which is feeling for it, which means you know something about it, which means you have heard about the stories and message of kRiShNa. when THAT happens, the faith will come, even your mind and intellect will not be able to deny. it is the message that kRiShNa gives through the unique bhagawadgItA, a summary of all the philosophy and spirituality gone before his time, that makes those who have heard the message call him jagadguru. one can argue that it was vyAsa who said all this through his character kRiShNa, but then we are missing the whole point. when we watch spiderman, and he says "with great power comes great responsibility" who says it actually? the character spiderman, the actor, or the screenplay writer? what do you remember in the end? that spiderman said it. do you even know who was the screenplay writer for the movie? so, in the end the message is important. but for bhakti, the persona is also important. do we analyze whether jesus really walked on water? it is not a matter of analysis. it is an indication of the powers beyond natural. that is why, all gods are depicted with four hands, to show their superhumanness. and durgA with 16 hands! the message given by kRiShNa is a good guide for ANYONE in the world, anyone can benefit from it, if one understands it properly. Nice One.. Hare Krishna !! It was not Kamsa but Dantavakra who was the actual incarnation of Jaya. Remember in their previous births viz Hiranyaksha-Hiranyakashipu, Kumbhakarna-Ravana, Jaya-Vijaya were brothers. Similarly in the 3rd birth, again they were brothers (specially cousins in case). The stealer of butter and hearts!